Cilantro might be the most polarizing thing on this planet. Some people can't eat a fish taco without it, others cry frothy tears of dishsoap at its mere mention. 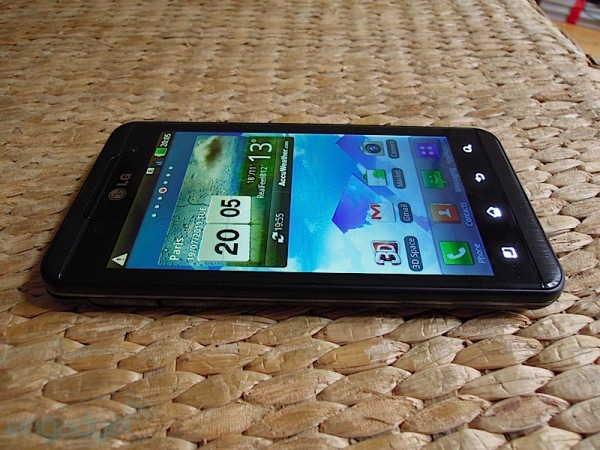 The same may well be true of the LG Optimus 3D (known as the Thrill 4G in the US). We already felt a little torn about the device when we first got our hands on it back in February. Sure, it packed some extra heft and, ahem, Android 2.2.2. But its stupor-inducing, 3D display (combined with some truly poignant marketing) was just enough to whet our appetites. Plus, after having already scarfed down a bowl of HTC's EVO 3D, we were more than a little keen on tasting LG's take on the glasses-free 3D recipe – a young and intriguing smartphone genre. Now that we finally have, we're ready to tackle a question for the ages: dishsoap or delicacy? How would you rate the Optimus 3D? There's no way to say this without hurting someone's feelings, so we'll just get it out there: the Optimus 3D is pretty... porky. At 128mm (about five inches) long and 68mm (2.67 inches) wide, it's not exactly the most pocket-friendly phone we've toted and, at 11.9mm (almost half an inch) thick, it's even a bit chunkier than the Optimus Black. The handset and its nearly six ounces of bulk could also benefit from a few extra hours on the treadmill. If you're looking for a larger device or don't mind carrying a little extra weight, it won't pose a problem. If, on the other hand, you expect your phone to do things like fit in your pocket, you may be disappointed. From a design standpoint, the device sports a streamlined look. Its rather ample, 4.3-inch LCD makes good use of the Optimus 3D's girth, spanning almost the entire storefront. Just above the screen is a silver LG logo, centered next to a 1.3 megapixel front-facing camera. Looming large over both of them is a trapezoidal earpiece that peeks out from the bottom of the upper bezel. Straddling the bezel's southern regions are four, understated Android buttons, backlit and waiting to illuminate upon command. Around back, you'll find a pair of stereoscopic 3D, five megapixel cameras, with an LED flash nestled in between. Both cameras sit on a stainless steel strip that runs left-of center down the phone's back side. They're also submerged slightly below the phone's back surface, providing some extra (and appreciated) protection. As on the front, LG kept its branding to a minimum, leaving as corporate droppings only a light gray logo and stereoscopic 3D engraving. These are both placed around a loudspeaker, which sits in the southwest quadrant. The speaker delivers clear sound, but it's far from a main attraction. The device is all curved edges and rounded corners, though the back side, strangely enough, is split into two levels, with the cameras sitting on the higher end of the ridge. 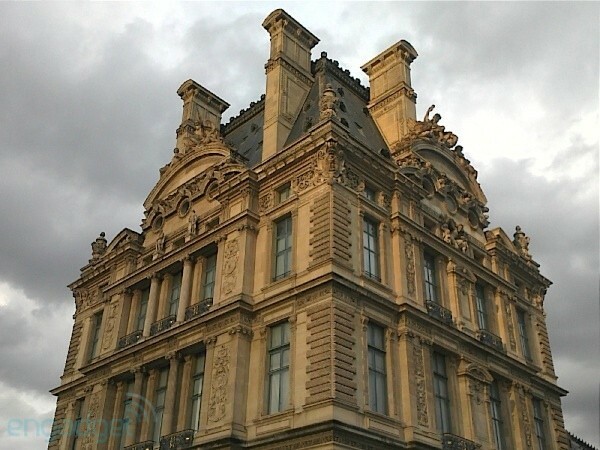 This architectural curiosity didn't pose any significant ergonomic challenges, but it's not the prettiest design, either. It's worth noting that the entire back shell can be lifted with remarkable ease, requiring barely a fingernail. Inside, you'll find SIM storage and a slot for a microSD card, which can be easily removed without disturbing the 1500 mAh battery lodged within. Along the left side sits a micro-USB port, stacked atop an HDMI socket. Either can be accessed by opening its respective hinged cover, but because both flaps are so close together (and unfold in opposite directions), it can be a little cumbersome to open both at the same time. These are positioned just below a thin silver layer that lazes along the phone's perimeter, providing a sleek border between the capacitive touchscreen up front and rubbery matte plastic covering its derriere. On the opposite side, you'll spot a volume toggle and a dedicated hot-key that takes you directly to LG's 3D Zone (more on that later). Up top is the power button and a 3.5mm headphone jack. At the center of all this, of course, is that skating rink of a capacitive touchscreen. It's large and in charge, but its ho-hum 480 x 800 resolution left us somewhat disappointed. Don't get us wrong – the display is sufficiently responsive, handles direct sunlight with grace and can muster some decent brightness of its own. But for a phone that promises such a dazzling visual experience, a more state-of-the-art panel could've paid serious dividends. 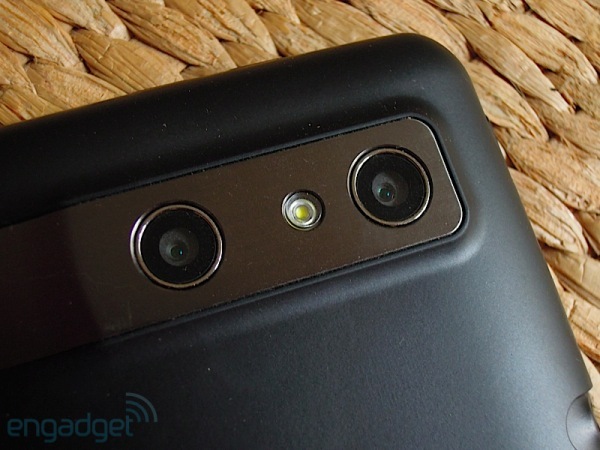 We couldn't find much of a reason to complain about the Optimus 3D's camera setup, but we couldn't find a lot to praise, either -- it's just there. It won't produce the same detail you'd get from the eight-megapixel lens on the Galaxy S II, but the Optimus' five megapixel sensor delivered a satisfactory performance, responsively adjusting to both low and high light. 3D shots turned out surprisingly well, with the phone's cameras delivering some pretty gnarly visuals. Images don't exactly jump out of the screen and into your face, but the relief is still sharp enough to invite intense gazing. Once you've captured your 3D pics, you can save them in either MPO or JPS formats, depending upon whom you're sharing them with. It's also worth mentioning that any 2D image can be converted into an extra dimensional shot, and vice versa. The phone's video capabilities, on the other hand, are much more compelling. Moving 2D images are captured in 1080p, at 24 fps, with 3D video in 720p, at 30 fps. We may have been over-caffeinated, but we had a difficult time keeping a steady shot in 2D, while the Optimus' stabilizing feature helped right the ship during 3D tests. Shooting in the third dimension, however, posed quite different challenges. When filming a person slowly walking toward the lens, the effect came out quite well. But as soon as faster-moving subjects unexpectedly entered the frame, video quality quickly deteriorated into patchiness and doubled images. However challenging they were to harness, the phone's 3D capabilities were ultimately more compelling than they were discouraging. We spent hours experimenting with various angles and mise-en-scenes, though it didn't take long for us to recognize the cinematic potential for more creative users to harvest. The question, however, is whether the medium is stunning enough to warrant a purchase, which brings us to the Optimus 3D's most cilantro-like quality: the glasses-less 3D experience. It's not for everyone. To be fair, it's definitely cool (in the "let me whip out my phone at a bar and make conversation" sort of way), and the novelty can be genuinely intriguing... for about five minutes. After that, spectators may either get bored with it, or end up feeling like their eyes were just juggled through a meat grinder (our experience skewed heavily toward the latter). You could attribute this evanescence to the relative lack of glasses-free 3D content, but LG's tech still has a ways to go before achieving universality. Whether we were playing games or watching video, we consistently noticed severe shifts in image quality with even the slightest of movements. When holding the device in landscape mode, the most innocuous of turns resulted in unsettling flickers. The same went for any vertical shifts toward and away from the display. Of course, LG carefully specifies all this in its pre-installed 3D guide, warning you about spending too much time in front of the display, but that doesn't make it any less jarring. And, while it doesn't take a Herculean effort to hold a phone still, our optic nerves shudder at the thought of trying to play a 3D game on a crowded, rush-hour subway. If you're planning to watch a ton of 3D content on your smartphone, you should probably look elsewhere – especially considering the aforementioned implications for battery life. For content creators, on the other hand, the experience would be slightly different, largely because of the filming capabilities mentioned above, along with the Optimus' content sharing features. The HDMI port enables direct connections to any 3D TV, which could be a cool perk for amateur filmmakers looking to add some spice to their home video collection. One of the Optimus 3D's most commendable qualities is its speed. Lurking within its bowels is an OMAP 4430 from Texas Instruments – you know, the 1GHz dual-core ARM A9 SOC that (briefly) ruled the benchmarking roost. Graphics come courtesy of a PowerVR SGX540 GPU, and there's 8GB of onboard memory, along with 512MB of dual-channel RAM. The device also performed impressively on benchmark tests, racking up over 2200 on Quadrant, 57.1 fps on Nenamark, 58 fps on Neocore and hovering between 35 and 40 MFLOPS on Linpack. Transitions between screens were about as seamless as we could've hoped, and the native browser performed admirably, smoothly and swiftly handling Flash and other online demands. We did notice some glitches and slow-downs when closing 3D applications and quickly executing a function on the homescreen, and there was some occasional freezing during app transitions. But they certainly weren't deal-breakers. 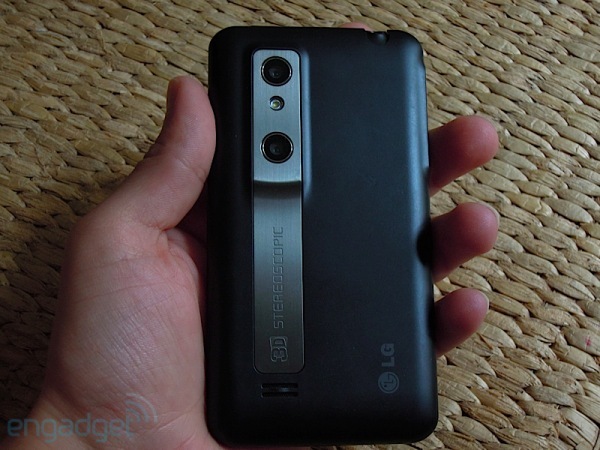 Much of LG's marketing has centered around the Optimus 3D's "Tri-Dual" architecture – a configuration combining dual-core, dual memory and dual-channel. This design effectively doubles the number of conduits through which data can travel, theoretically allowing for faster performance and more efficient power usage. We noticed speedy processing on web pages and apps, though the configuration certainly didn't do much for battery life. Endurance, in fact, may be the Optimus 3D's most glaring weakness. Though our everyday use consisted of nothing more than checking e-mail, updating Twitter and occasional 3D gameplay, we still found ourselves recharging the device every ten to 12 hours. As you'd expect, depletion rapidly accelerated when we used the 3D features more heavily. After conducting formal tests, we found that it takes about seven hours to completely drain the phone's battery, when put under slightly more strain. Keep in mind, however, that we conducted these battery tests without even touching any of the phone's power-sucking 3D content – which isn't a good sign, considering that 3D is the device's signature feature. Reception over an HSPA network in France was refreshingly stellar, even in our Bermuda Triangle of an apartment. On average, the device received about one to two bars more than what an iPhone 4 picked up on the same network. At 75 percent volume, the earpiece carefully toed the line between loud and tinny and no one reported connection issues on the other end. The Optimus 3D already entered the software game at a serious disadvantage, by virtue of the fact that it ships with Froyo. Who knows if that'll change by the time it hits the US, but for the moment, the lack of Gingerbread is pretty unfortunate. The layout is depressingly sterile, and its limited functionality made the overall experience seem unremarkable. That said, it's an entirely functional OS – everything does what you'd expect, without too many bells and whistles. To unlock the phone, you just have to slide the screen upward. It's a simple enough gesture, but we noticed persistent chops in the animation, making the icon unfold more like a creaky garage door than a crisp can of sardines. Arriving at the home screen, you'll find the second generation of LG's Optimus UI on full display, with weather and clock widgets bannered across the top of the screen, and a smattering of standard apps growing along the bottom. Scrolling one panel to the right, you'll find the browser, music app, photo gallery and dedicated 3D games app, while the easternmost panel houses a clean, large calendar, which you can sync with your Google account. On the far left lives a social media widget, which aggregates feeds from your various accounts, right next to a panel of your "favorite contacts" – the illuminati from your phonebook with whom you want umbilically instant contact. It's all very simple. Very... plain. But LG has gone the extra mile to emphasize the ostensible crown jewel of its new headset: 3D. As we mentioned above, there's a dedicated hot-key that will whisk you away to LG's "3D Space" – a pleasant little carousel full of games, videos and epilepsy. The pre-loaded content provides a relatively smooth introduction to glasses-less 3D, and there's a widget devoted exclusively to 3D clips on YouTube. The 3D Store, meanwhile, connects you to LG's browser-based marketplace, where you can purchase more games or multimedia. It's clear that software isn't the Optimus 3D's best side, though we'd be eager to see how a Gingerbread update would influence its complexion. 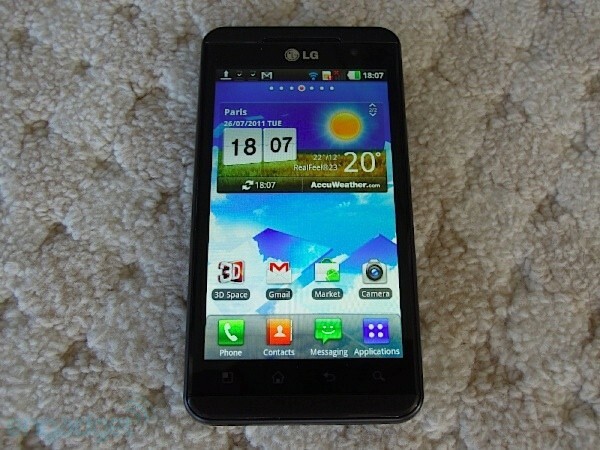 It's also clear that LG put almost all of its Froyo muscle behind its 3D features – which says a lot about the Optimus 3D. All told, the Optimus 3D is a perfectly serviceable, largely inoffensive smartphone that just so happens to possess 3D capabilities. Like the idiot savant math whiz, or the high school phenom with a poisonous crossover, LG's latest creation occasionally shows flashes of brilliance, but still lacks some fundamental qualities -- in this case, sophisticated software and a grittier battery. 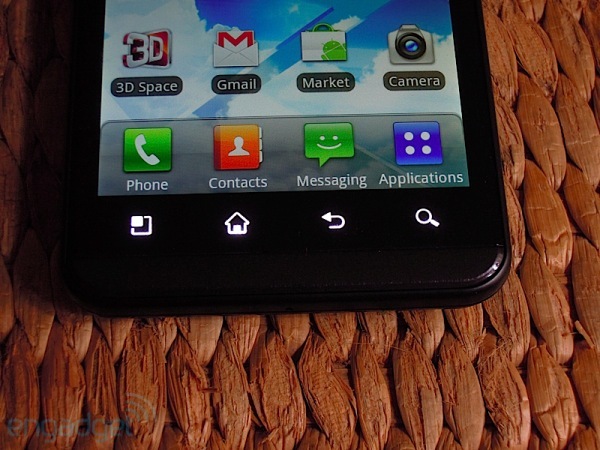 To LG's credit, the Optimus 3D isn't trying to be something it's not. 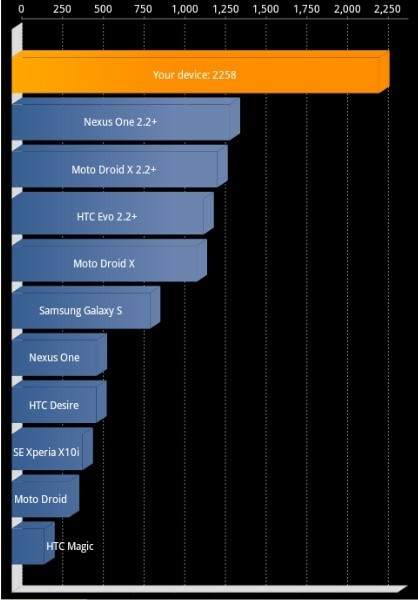 It's certainly not reaching for the Samsung Galaxy SII's heights, nor is it looking to out-duel its Gingerbread-less brethren, like the Droid X2. Instead, the device seems to realize that it's a one-trick pony, and devotes all of its energies to harvesting that comparative advantage. For most people, that one trick probably won't be enough to justify buying an otherwise vanilla (and large) handset. 3D pioneers, on the other hand, may be more willing to shell out the £500 (about $820), as long as they're not expecting much more than extra-dimensional eye candy. At this point, it's hard for us to call LG's 3D technology anything other than a gimmick, but it's still a fun gimmick -- even if it leaves a somewhat soapy aftertaste.